Your mouse pointer will turn into an X. Click on an application window with the X for Xkill to, well, kill it. Go to Gnome Menu > Applications > Preferences > Keyboard Shortcuts. Enter xkill as both the Name and Command line, then click the Apply button. Your xkill shortcut will show up in the list as a Disabled shortcut. Click once on this Disabled row in the Keyboard Shortcuts window; the Disabled status will change to New shortcut. Press a new short-key combination, for example, Ctrl+Shift+X, which willthen be activated as the keyboard shortcut to invoke xkill. If you activate xkill accidentally, you can right-click to cancel it; the mouse pointer should change from an X back to your standard shape. 3. If you are using Gnome Panel, right-click on a blank area of the panel, select Add to Panel. 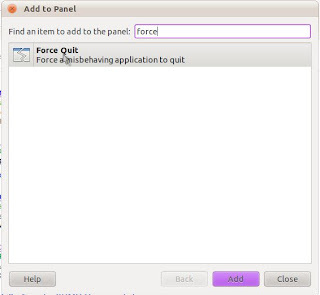 Search for 'Force Close' or 'Force Quit' (the xkill equivalent name in the Graphical interface) to add the icon. Xkill is ready to use. Press the key combination to turn the cursor to an X-sign, drop the X-sign onto the application to close and left-click once. It will terminate the unresponsive program. Note you will lose any unsaved data in that application.